The nomination of Phil Meador, president and owner of Phil Meador Toyota in Pocatello, Idaho, for the 2016 TIME Dealer of the Year award was announced by TIME. Meador is one of a select group of 50 dealer nominees from across the country who will be honored at the 99th annual National Automobile Dealers Association (NADA) Convention & Exposition in Las Vegas, Nevada, on April 1, 2016. In its fifth year as exclusive sponsor, Ally will recognize dealer nominees and their community efforts by contributing $1,000 to each nominee’s 501(c)3 charity of choice. Nominees will also be recognized on AllyDealerHeroes.com, which highlights the philanthropic contributions	and achievements of TIME Dealer of the Year nominees. The TIME Dealer of the Year award is one of the automobile industry’s most prestigious and highly coveted honors. Recipients are among the nation’s most successful auto dealers who also demonstrate a long-standing commitment to community service. Meador, 65, was chosen to represent the Idaho Automobile Dealers Association in the national competition – one of only 50 auto dealers from 16,000 nationwide – nominated for the 47th annual award. A panel of faculty members from the Tauber Institute for Global Operations at the University of Michigan will select one finalist from each of the four NADA regions and one national Dealer of the Year. Meador, a 1968 graduate of Payette High School in Payette, Idaho, earned a B.S. in history and social studies from the University of Idaho in Moscow in 1972. At college, he was on the dean’s list, played varsity baseball and was a member of the fraternity Phi Kappa Tau, Beta Gamma Chapter. He also served in the Army Reserve Officers’ Training Corps (ROTC) for three years. After college, Meador had a series of jobs before taking a sales position at West Park Volkswagen in Ontario, Oregon, in 1974, his first experience in the retail automotive business. In 1977, Meador partnered in a dealership in Pocatello and by 1982, he became the sole owner. 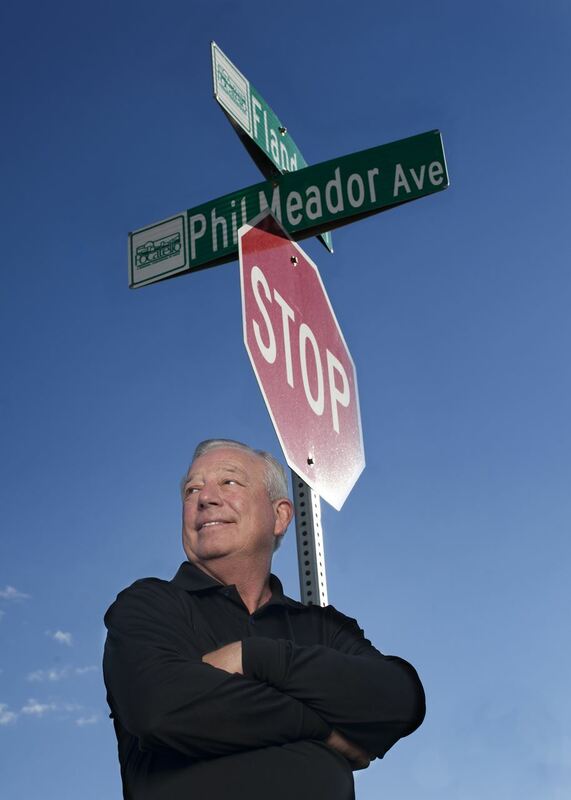 He bought property in Pocatello, constructed new buildings, acquired and sold dealerships, and today owns Phil Meador Toyota, Courtesy Ford Lincoln and Phil Meador Subaru, all in Pocatello. His wife, Bekki, has been the controller for the business for 37 years. Meador also treats his community like family and opens his dealerships for local events, including high school dances, senior proms, the annual Idaho State University (ISU) Bengal Foundation auction (for the past 20 years) and an annual fundraising dinner/auction for the Holy Spirit Catholic School of Pocatello. He also donates four autos annually to ISU and makes other contributions to the university, as well as to Pocatello High School. His dealerships turn into community centers to raise money and awareness for a range of causes. Meador collects food for Feeding the 5000, a local food drive, and held blood and bone marrow events through Angels for Alec. “We have enrolled more bone marrow donors per capita than any city in the United States,” Meador said. He also hosts fundraisers to support the Pocatello Animal Shelter, including drives for pet food and the annual Run with the Big Dogs walk/run, plus collects gifts for children through Toys for Tots and the Salvation Army Service Center’s Secret Santa. He added, “But when it is all said and done, I hope that I am remembered for much more than just selling cars." Meador was nominated for the TIME Dealer of the Year award by Kevin Hanigan, VP / Executive Director of the Idaho Automobile Dealers Association.